The more I learn about dandelions, the more amazed I am. Not only is this common weed a wonderfully edible plant, but it has great medicinal properties, too. For example, my mom-in-law has had some painful kidney stones. I recently recommended she drink dandelion root tea - a pretty widely accepted remedy for them. 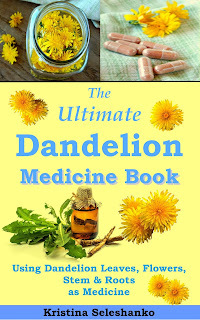 Dandelion root is especially good for her, too, since she's a cancer survivor, and there's some evidence (currently being studied scientifically) that ingesting ground up dandelion root is an effective cancer treatment. I also consume dandelion root daily, in an effective natural treatment for non-alcoholic fatty liver disease called Lipotropic Complex. Dandelion root is one of the main ingredients - and if I ever run out of the pills, I make sure I have a few cups of dandelion root tea a day. 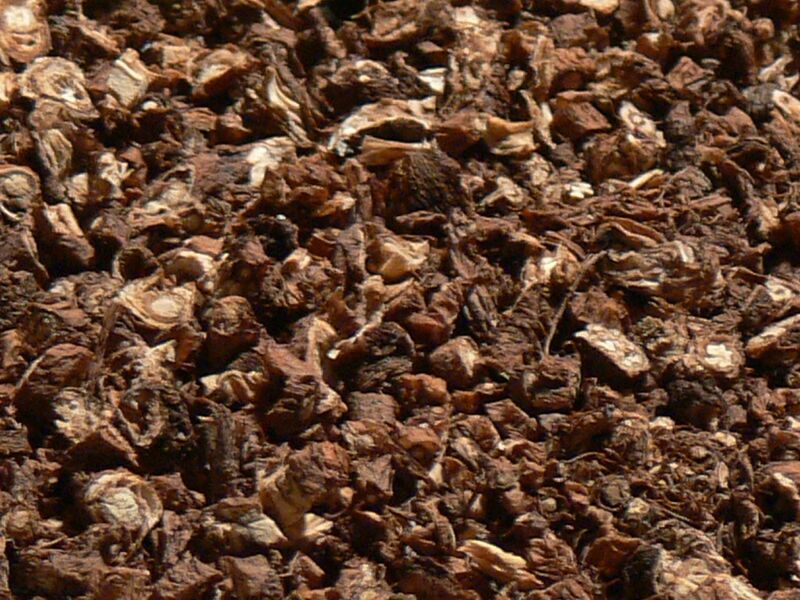 Other medicinal uses for this root include detoxifying the body, gallbladder woes, yeast infections, gout, PMS, diabetes, eczema, and urinary tract infections. Dandelion roots are also rich in inulin, a prebiotic that encourages healthy microorganisms in the gastrointestinal tract. 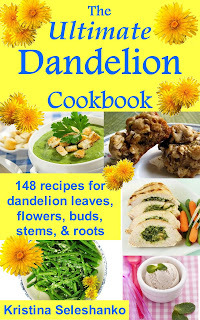 You can read more about the medicinal value of dandelions here. But here's the thing: I find that many people just never get around to harvesting dandelion roots for themselves. Some people tell me they have trouble finding dandelions except where pesticides are sprayed - or they can only find them by roadways, where the plants leach up fumes and therefore are unsuitable for consuming. I have one friend (who lives in a different state) who says there are no dandelions in her area (!). I even have one friend who gets the heebie jeebies just thinking about digging up and touching live plant roots. Fortunately, there are several options for obtaining dandelion roots - and for consuming them, too. 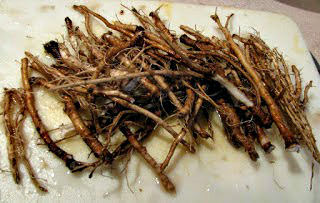 Dandelion roots fresh from my yard. Believe it or not, you can buy dried dandelion roots in many places. I've seen them on Ebay and Etsy - but I recommend buying them from a more trusted source, so you can be sure you are getting real, organic roots. Mountain Rose Herbs, for example, sells dandelion roots in several forms. There's also a product called Dandy Blend that combines roasted dandelion root with a few other herbs for a really delicious drink that tastes similar to coffee; I've seen Dandy Blend in health food stores, and on Amazon. Another option is to look in an ordinary grocery store, in the tea section. The brand I see most often is Traditional Medicinals Dandelion Root Tea. I've found it at Walmart for a little over $4 a box. And, of course, you can harvest your own roots. Click here for complete directions on harvesting and drying dandelion roots. Finally, I've seen dandelion root in pill form. However, not only is this the most expensive option available, but I haven't seen these pills from a high quality and trustworthy supplement company. Which Type of Dandelion Root is Best for You? Plain dried dandelion root is quite bitter; I actually enjoy the flavor, but many people add red raspberry leaf or a bit of real honey to lesson it's bitterness. Roasted dandelion root tastes a lot like instant coffee. Which you choose is really a matter of personal preference. In either case, though, you'll need a coffee grinder to prepare the roots for medicinal use. (Here's the grinder I've used for years). Pre-ground dandelion root is, in my opinion, not as good an option, since grinding the root and letting it sit means it's lost more of its medicinal properties. You'll always end up with a better quality drink if you grind just before consuming. Dandelion root in tea bags or "coffee form" is, in my opinion, the least medicinal option. That's because it's pre-ground, and - in the case of tea bags - none of the power actually gets consumed by the tea drinker. (The powdered root is held inside the tea bag.) Nevertheless, this is the easiest way for most people to get dandelion root into their diet, and if brewed according to the package directions, personal experience tells me it's still pretty effective. To make it better still, considering breaking open the tea bag and following the directions in the next section. When making dandelion root tea with a tea ball, fill half the ball with partially powdered root. Or you can completely powder the root 1 or 2 tablespoons at a time and place it in a glass of water. If you really dislike the flavor of dandelion root, place the powder directly in orange juice, which completely or mostly (depending upon who you talk to) covers up its flavor. Cautions: According to the University of Maryland Medical Center, very rarely, people have reactions to dandelion root. If you're allergic to "ragweed, chrysanthemums, marigold, chamomile, yarrow, daisies, or iodine, you should avoid dandelion. In some people, dandelion can cause increased stomach acid and heartburn. It may also irritate the skin. People with kidney problems, gallbladder problems, or gallstones should consult their doctors before eating dandelion." Dandelion is a diuretic, which means it may also make other medications less effective. To learn more about this, visit the University of Maryland Medical Center website.